A new book out this year by Jackson, Missouri prosecutor Morley Swingle is on my list of top ten true crime books of 2007 -- and I haven't even read it yet -- because anyone who can endure 120 jury trials, including 69 homicide cases, with his funny bone intact has an uncommon gift. Add the fact that said author is steeped in the true crime genre, and the book, unseen, earns my utmost approbation. I must insist that my Clewsians purchase a copy; we can jointly fund his retirement so he can permanently take up the pen. "When I first began my career as a prosecutor," Swingle says, "I started what I called my 'humor file.' Every time something funny happened in one of my cases, I made a note about it and put it in the file." The result is Scoundrels to the Hoosegow: Perry Mason Moments and Entertaining Cases from the Files of a Prosecuting Attorney. No less a personage than Vincent Bugliosi called it "consistently fascinating" and "engrossing." "My goal was to write a book that would make the reader laugh out loud," the author adds, "but at the end, he or she would have a better understanding about what it truly means to be a prosecuting attorney. I think of the finished product as a cross between Seinfeld and Law & Order, except that every story is true." I recently had the chance to chat up this author, and he kindly replied; his saucy answers have me longing for Scoundrels. Enjoy! How did you come up with the delicious title? For a while my working title was Perry Mason Reruns and Other Prosecutorial Nightmares. Although catchy, it didn’t really describe the book. Scoundrels to the Hoosegow is a collection of true stories from cases I prosecuted. Each shows a bad guy getting brought to justice. Many times justice includes going to jail. I played around with synonyms for villains and jails until I came up with the combination of scoundrels and hoosegow. As soon as I said it aloud, I knew I’d come up with something Mark Twain would have enjoyed. Is there any particular story in your book that has generated strong reaction in readers? “The Case of the Dog on Death Row” – A man placed on probation for DWI is ordered to perform community service, which ends up being helping the vet euthanize dogs at the pound. The scoundrel concocts a plan to set free all the dogs one dark and stormy night. “The Case of the Perry Mason Moment” – A woman hires a hit man to kill her husband but eventually learns how darn hard it is to find a reliable and discreet hit man these days. During her trial, I experienced my first true “Perry Mason Moment,” where the outcome of the case was nailed down by my cross-examination of a defense witness. “The Case of the Far-Flung Firearm” – My 13-year-old daughter’s favorite. The only time I went with the police on the execution of a search warrant culminated by my throwing myself to the ground to avoid what I thought was a grenade. “The Case of the Cross-Eyed Juror” – An involuntary manslaughter trial over a college hazing death produced my most bizarre moment in a courthouse. “The Case of the Embarrassing Defense” – A 63-year-old lawyer and his wife decided to get a divorce. They went about it the All-American way. Each hired a private investigator to tail the other. Hers trumped his, big-time. “The Case of the Forgetful Drunk” – A successful businessman traveled the 100 miles from Cape Girardeau to St. Louis to attend a Cardinals baseball game. His drunk driving offense on the way home has an extremely surprising twist. Of all the true crime books you have read, which was the most memorable, emotionally satisfying reading experience? Wow! You have a cruel streak to make me narrow it down to just one. Using your criteria of “memorable” and “emotionally satisfying,” I would say The Blooding by Joseph Wambaugh. Memorable? I read it in 1990 and recall it vividly to this day. Emotionally satisfying? He takes the first case solved by DNA evidence and turns it into a mystery thriller. He writes so well that even his discussion of the science of DNA is fascinating. Also, it is terrific fun as an American prosecutor to watch those British police in action, unhampered by teeny little obstacles like the Fourth Amendment to the U.S. Constitution! Who are your favorite authors? Favorite titles? Now I get to list my runners up to the previous question. Small Town D.A. by Robert Traver is so good I have read it four times. This book, published in 1954, is the closest thing to my own Scoundrels. In it, Robert Traver, the author of the novel Anatomy of a Murder, writes with humor and candor about his fourteen years as an elected prosecutor. I would have listed it as Number One except that the “memorable” requirement tripped me up. When I thought about it, I could not specifically recall the details of any of his stories. I just remembered that they were entertaining. I went to the library and used Current Authors (remember when that was the best way to find out more about a writer?) to learn more about Robert Traver. Turns out, as you know, his real name was John D. Voelker, and he had served 14 years as a prosecutor in Michigan before becoming a Supreme Court judge. He wrote Anatomy of a Murder because he felt current fiction did not accurately portray murder trials. Outrage: The Five Reasons Why O.J. Simpson Got Away With Murder by Vincent Bugliosi is a book I give to every young prosecutor who starts working at my office. It is a “how to” book about how NOT to prosecute a criminal case. Bugliosi lists and explains the terrible mistakes made by the prosecutors in the Simpson case, and accurately points out that most good prosecutors could have won the case with the evidence gathered by the L.A. police. He presents the closing argument he would have given in the case and makes us wish that a better trial lawyer would have been assigned the case for the prosecution. Do you have a strong opinion on Mike Nifong? He has done a true disservice to prosecutors across the country. He is the Mike Tyson of prosecutors – an ear-biter and a whining bully. One of the best things about being a prosecutor is the ethical duty to seek justice. A criminal defense lawyer or attorney in private practice is a hired gun for the client, bound to zealously represent them even when they are guilty. A prosecutor, on the other hand, has different ethical rules. Your duty truly is to seek the truth. You are never saying something to a jury or judge that you do not believe. If you have a reasonable doubt about a defendant’s guilt, your ethical duty is to dismiss the case. You never want to go home thinking it is even remotely possible that an innocent person is in jail because of you. You try your cases in the courtroom and not the media. It is refreshing to always be wearing the white hat. Nifong represents the sort of prosecutor who usually only appears in bad fiction or soap operas. He filed a case based upon skimpy evidence and stuck his head in the sand and pretended he was still seeking justice even after it became clear to everyone else that he was no longer really seeking the truth but was trying to preserve what was left of his ego and his popularity with the African-American voters in his district. He violated most ethical rules pertaining to prosecutors. I predict he will be disbarred, if he hasn’t been already. I’ve read her book, Objection! She has probably found her niche where she is now. I doubt she was a formidable adversary as a prosecutor. Oops, I guess that nixes any chance I ever had of promoting Scoundrels on her show. That was a trick question! I was misquoted! Laura James promised we were off the record! Yeah, that’s the ticket! Who is the best prosecutor to ever grace an American courtroom? Vincent Bugliosi is the best prosecutor of my lifetime. In each of his books, the time he spends preparing for court is emphasized. Preparation is often the difference between an outstanding lawyer and a merely adequate lawyer. Another truly outstanding prosecutor is Tom Dittmeier, the former U.S. Attorney in St. Louis, who still works for the office as an Assistant U.S. Attorney. He has tried a huge number of jury trials and is among the best who ever lived. His lectures on cross-examination and closing argument, given for the nation’s prosecutors at the National Advocacy Center in Columbia, South Carolina, would be hugely educational and entertaining for your true crime buffs. Abraham Lincoln. He sacrificed everything in his personal life to keep our country from falling apart. He is the greatest writer to ever serve as President. He had more wit and wisdom in his little finger than all of the Presidents since, put together. Winston Churchill. His courage and leadership made a difference in the world. He is an inspiration to anyone who vows to stand up against evil, no matter the odds. Vincent Bugliosi. He is the epitome of an outstanding prosecutor. He is an impressive writer, too, both of books and closing arguments. Mark Twain. I love his sense of humor. I love his zest for life. I love his compassion for people in all walks of life. What are we to make of the rash of DNA exonerations today? I read Barry Scheck’s Actual Innocence. I was left wondering whether, as Paul Harvey would say, we should hear a segment about “the rest of the story” as to each of those cases. I wonder if some of his examples were exaggerations. From my own experience with 69 homicide prosecutions and four killers placed on death row (one executed so far) I can tell you that a prosecutor in a death penalty case will make sure the defendant is guilty beyond ANY doubt, not just beyond a reasonable doubt. There is no way that any murderer I have ever prosecuted was not guilty. As a practical matter, it is hard enough to convict a guilty person, much less an innocent one. Why anyone thinks a prosecutor would want to do so is hard for me to understand. But then, along comes a guy like Mike Nifong to remind us that not all prosecutors are the same. The photo on your office’s webpage [above]- what on earth were you doing there? I was prosecuting a police officer named Steven Rios (married with child) for murdering his gay lover (a college boy he had arrested). The boy’s almost naked body was found lying in the grass near his apartment, with his throat slashed and bruises between his shoulder blades. The crime was unsolved for a couple of weeks, but limb hairs on the victim’s chest ended up matching to Rios’ DNA. In the photo, I was having a man who teaches choke holds to police officers demonstrate the unilateral vascular neck restraint upon me. The medical examiner and I felt the bruises between the shoulder blades were consistent with this particular choke hold, which can render a person unconscious within 3 to 5 seconds. The blood pattern indicated that the boy’s neck was cut after he was on the ground. We believe Rios grabbed the boy from behind as the boy was fleeing from him and choked him. Once he was unconscious, he cut his throat. 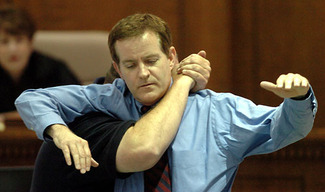 During the demonstration, the instructor actually put me to the floor of the courtroom. As it was going on, I was a bit concerned that if I went unconscious it might make me lose my train of thought! Are you planning to write more non-fiction in our favorite genre? Yes. One of these days I am going to take one particular case and shoot for the same thing Robert Traver sought in Anatomy of a Murder. I want to show what it is really like to try a murder case. I did it in Scoundrels with “The Case of the Millionaire Murderer” and “The Case of the Homicidal Energizer Bunny” and “The Case of the Weeping Witness,” but the book I have in mind would go into more detail and read more like a mystery. I have also considered approaching Tom Dittmeier and asking if I could write his biography. He has tried so many big cases it could serve as both an entertaining true crime book and a “how to” for prosecutors. Finally, I am toying around with a sequel to Scoundrels, collecting funny, odd and entertaining cases from other prosecutors across the country. I’ve already got the title in mind. As clever as you are, you could undoubtedly figure it out if I gave you a few clues, so I won’t. For more Morley, see the publisher's website for Scoundrels and the official website for the Cape Girardeau County Prosecutor's office. This was a very interesting post. I am going online to buy the book right now! Fabulous.